Transform a photo of your furry or feathered friend into a wearable work of art. Your special pet has always been one gem of a friend to you, so why not show them off for the special treasure they are? Designer Erin Harris makes it possible by transforming a photo of your furry or feathered friend into a wearable work of art. 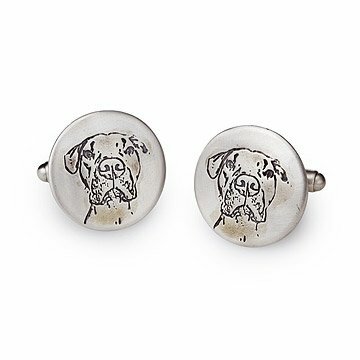 To create this personalized, sterling silver pair of cufflinks, she works from a photograph of your pet, first transferring the image by hand onto a customized rubber stamp. That stamp is then used to emboss the image into the domed surface of the pendant. The artist then engraves your pet's image directly onto the silver. The result is a precious keepsake that will last a lifetime, celebrating your bond with your #1 pup or cat. Harris also includes the rubber stamp, which you can use to personalize cards, scrapbooks, and more. Handmade in Montpelier, Vermont. It was the memory of a dear friend that turned erin l. m. harris into a self-described “sentimental metalsmith.” After her beloved dog Gonzo died in 2008, the Vermont artist was moved to commemorate furry friends. When starting one of her pictorial pieces, “I imagine someone who adores their pet,” she says. ”I imagine how much comfort the jewelry will give them if their pet has recently departed this earth. If their pet is still alive and well, I imagine the look of surprise, delight and glee when they open the package and say, ‘It looks just like him!’" Indeed, animal lovers often send erin testimonials. One man revealed that his wife told him the pendant was the most thoughtful gift he’d given her in their 20-year history. “I’ve had many reactions that have made me cry,” she says. Polish with a dry silver polishing cloth. Avoid liquid tarnish remover. Service was great! Personal email, packaging. Everything I couldn't ask for more! I was emotional just opening the box. Really amazing, my husband loves them, they mean a lot to him. He wore them the next day and showed them off. The artist was very personable and helped me make this gift absolutely perfect for my friend. She worked with me on making sure the quality of the product matched what I wanted. The little touches that come with this gift from the "forget me not" seeds to the etch plates just add to the entire experience. I bought this as a gift for my husband and he LOVES it! Erin does a WONDERFUL, amazing job taking a photo of your pet and turning it into these cuff links. We love these SO much and can't express our gratitude enough for how well these turned out. Great gift and wonderful keepsake. Love, love our pet cufflinks! Since we have two dogs, Erin and Uncommon Goods were able to work with me on customizing each cufflink for each dog! Although we couldn't have our dogs physically present on our wedding day, this memento made it feel like they were with us. My husband cannot wait to show off his new cufflinks. These cufflinks are high quality and the picture came out beautifully. Erin was super easy to work with. She sent me a proof before she made the cufflinks and they arrived well before the date promised by Uncommon Goods. My husband was completely surprised and incredulous that I found a way to get our pooch's picture onto cufflinks. I would highly recommend this product, or anything Erin produces! Amazingly touched to see this beautiful guy, once again. 10 years ago, my husband and I decided to start our family by rescuing two feral dogs. We were so lucky to have a wonderful nine years with both of them... But recently we lost our male dog. It has been a heartbreaking experience and this is such a beautiful way to help commemorate him. The accuracy of the image was spot on! Cuffs actually work well and will definitely be ordering more in the future. The hand signed note was also a very nice touch. The artist really captured the likeness of my dogs. They turned out really cute, and my husband loved them. I love them!